After acquiring the Miravue VIP-1 from Miravue, RTI is now making the video over IP system available to dealers. The RTI Miravue VIP-1 System utilizes the H.264 codec to deliver 1080p content, along with Dolby 5.1 audio. Earlier this year, the popular control and automation company Remote Technology Incorporated (RTI), acquired the Miravue VIP-1 from Miravue, and now several months later, RTI is shipping the AV over IP system. Upon announcing the acquisition this past February, RTI's CEO Ed McConaghay said the Miravue represents an important asset to help RTI provide integrators state-of-the-art AV over IP solutions. "Acquiring the Miravue video-over-IP solution is a key step toward our goal of providing integrators with everything they need to automate any environment," says McConaghay. "We will continue to use the Miravue name for our expanding line of video-over-IP products." Mike Everett, vice president of global sales, RTI, says the Miravue VIP-1 system provides integrators with a reasonably priced media distribution solution that can be used for a range of applications. "For our dealers, the incredible flexibility of the VIP-1 helps lower the costs of AV distribution in commercial and residential projects," comments Everett. "The unit is an exciting addition to our expanding line of AV distribution products and the RTI ecosystem as a whole." RTI says the VIP-1 serves as a transmitter and receiver, helping the system compliment both residential and commercial A/V settings. By serving as a transmitter and receiver, RTI says the solution lowers system cost by reducing the amount of hardware, cabling, and labor required to specify and install RTI Miravue AV over IP systems. The combination transmitter and receiver employs the H.264 codec to support 1080p HD video and audio formats such as Dolby Digital 5.1. The low-latency system also includes a built-in scaler that matches the resolutions of connected display devices while automatically delivering stereo downmixing and lip sync adjustments. 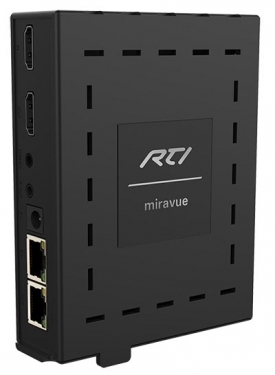 The RTI Miravue VIP-1 system is designed to integrate into both new construction and retrofit system environments, and because of its low bandwidth requirements, it works with unmanaged switches as well as more expensive gigabit managed switches. In addition, RTI says that integrators can also combine the Miravue VIP-1 system with its XP processor to act as an extension of its control ecosystem to provide IR and RS-232 control options to external devices.